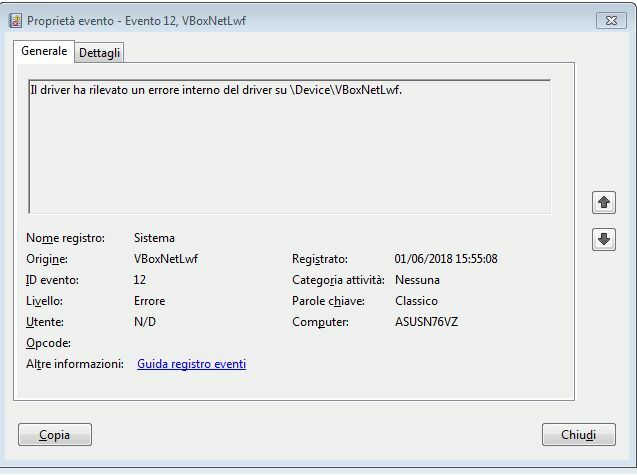 ID Event 12 for VBoxNetLwf: Driver detected an internal error in its data structures for \Device\VBoxNetLwf. This error appears in my two systems, one with Windows 7 64 bit and one with Windows 10 64 bit. I don't know what it is, though, and VirtualBox works properly. You are not alone, I've had the same problem. "The driver detected an internal driver error on \Device\VBoxNetLwf." I also have noticed my CentOS VM now has network issues and requires a suspend and start in order for the networking to work correctly. Or a full restart. In my case its a little more serious, I am diagnosing BSOD errors. On laptop wake from sleep mode or hibernate it sometimes get a BSOD, noticed this in the logs and was wondering if its related. Your post tells me it not likely the cause of the BSOD but merely a network driver issue for VirtualBox that if anything effects linux VM network issues for certain builds. Windows 10 Pro 64 bit - fresh install, VirtualBox 5.2.12, 32 gig ram, 2 x SSD. klaus wrote: Lately there is an increase of extremely vague posts which don't contain the bare minimum information to reply anything sensible. Keep in mind that this results in your post being ignored, which is the opposite of what you want. So provide as much detail as you can, please, as this will ensure you get a good and fast answer. This is essentially just a repeat of the Forum Posting Guide, which to a large extent is just written down common sense. Hi, I don't know if you were referring to me; however, I just wanted to report that issue. I don't know what it is caused by and, as it reguards me, it doesn't seem to affect my VMs, but it seems we have at least another user with the same issue which is causing him troubles. I have the same problem - Win7-64, new installation. It occurs almost immediately when the system resumes after a sleep (not hibernate). It is 100% reproducible. Description:   The platform firmware has corrupted memory across the previous system power transition. Please check for updated firmware for your system. But I don't think that this is what you're getting. Can anyone of you that are seeing this happening, post the complete event in a similar form as above? Both in my systems (Windows 7 64 bit and Windows 10 64 bit) the source is just VBoxNetLwf, but I have no description. Is your log taken from Windows Event Viewer? I put a screenshot, even if my language is Italian. You should have attached the image here, locally. See the "Upload attachment" tab below the reply form. Mr Wolf wrote: but I have no description. Is your log taken from Windows Event Viewer? No, it's not, it's from the Microsoft article that I linked to. What about if you click on the "Dettagli"? It looks like "Details". Opsss... sorry, I thought it was your log. P.S. I don't know if you are into movies, but I've just watched a Greek movie. "Kynodontas", and I'm going to watch another movie, "Miss Violence". Very... "peculiar". 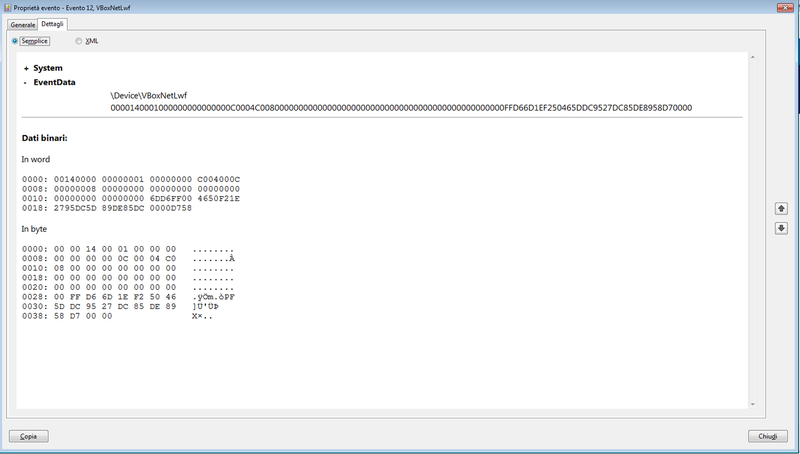 I also see this kind of events in the Windows event logs, for VBoxNetLwf. Windows 10 64 bit 1709. Interestingly enough, the first event was on May 1st, this year. What if you click on the "+ System" on the top? Didn't you ever play "Hide and Seek" when you were young? BTW, I didn't say to use the "img" tag, I said to use the "Upload attachment" below the reply form. PS. I've seen "Dogtooth" (that's what "Kynodontas" means, Kynos=dog: think "canine", odontas=tooth: think orthodontic, dentist), haven't seen "Miss Violence" yet. And "peculiar" is kind of a gentle characterization. Ok... img tags are meant to post images and usually I use them. If these damned logs were clear, I could try to figure it out myself what the problem is. P.S. Yep, I think "Dogtooth" is the international title. I forgot I also - cough cough - have other titles from the same director: "Alps" and "The lobster". I'll watch them when I'll be in the right mood. Mr Wolf wrote: Ok... img tags are meant to post images and usually I use them. Mr Wolf wrote: If these damned logs were clear, I could try to figure it out myself what the problem is. I'm not quite sure if it's an error or a red herring. There's nothing going on here that's wrong, you're simply getting an entry in the Event Viewer. BTW, and that's a question for everyone: do you have Fast Start enabled on your computers? If yes, can you disable it? Mmmmm... the point is this issue has never appeared before the latest 2-3 releases. I'm pretty sure, because for some reasons I check Windows Event Viewer almost everyday. And in the Event Viewer is marked as an "error" (red circle with exclamation point) and not as a "warning" (yellow triangle with exclamation mark) - whatever the difference is supposed to be. In both my systems (Windows 7 64 bit and Windows 10 64 bit), I have enabled CSM Support, not Fast Start. However, as far as I'm concerned, it isn't causing any trouble with my VMs. Well, that's maybe because they're trying to solve several problems with the sleeping mode on Windows and loss of networking. Maybe something that they changed in their sleep/wake algorithm doesn't "quite" agree with Windows.